Our company is small by design, which enables us to give personalized service to our clients. Our success depends on positive client experiences. We pay attention to detail, give quality craftmanship and hard work, offer communication so that we can meet and often exceed the expectations of our clients. 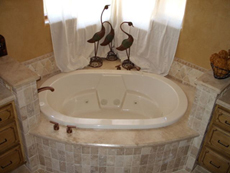 Our mission is to provide our customers with the highest quality of workmanship and stone. We offer a wide range of products related to natural stone fabrication. From kitchen countertops, through vanity tops, jacuzzi and fireplace surrounds to full wall and floor paneling - our products are always fabricated with the upmost precision and quality.